It’s been a while since the last time I wrote about what I read. I’m not that much a bookworm but I love books. I also love strolling around bookstores and I take book shopping as a guiltless therapy. However, today I’m going to tell a bit about one of my 5-stars-personally-rated books which I didn’t buy in bookstore. ‘The Philosophy of Andy Warhol‘ by Andy Warhol. I’m a fan of Andy Warhol and his pop art. I knew he wasn’t only painting but also directing, BUT I didn’t know that he wrote great stuff. I found this book at Museum of Contemporary Art museum shop in Sydney. It was the only copy left on display. Honestly, I had never seen it before I bought it, even after that. I just think that universe wanted me to have it, so it happened. 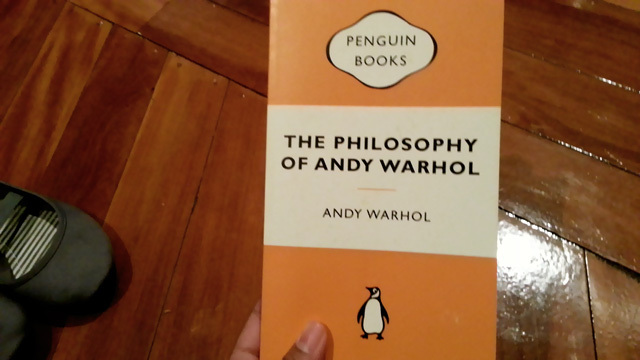 ‘The Philosophy of Andy Warhol’ was firstly published in 1975 and firstly published by Penguin Books in 2007. It consists of 15 chapters: Love (Puberty), Love (Prime), Love (Senility), Beauty, Fame, Work, Time, Death, Economics, Atmosphere, Success, Art, Titles, The Tingle, and Underwear Power. The first 10 chapters are Warhol’s random thoughts written in short paragraphs making them just like blog posts compiled into such enjoyable book. Last 5 chapters are more like short stories but the 14th chapters 27 pages of phone conversation with B and almost only B blabbering. Still, it’s Warhol! I like this post. Somehow Andy Warholl that I know, as someone who is so artsy and anti-mainstream (perhaps), suddenly change into a wise old-man who see world in skeptical and honest way. Thank you for your post, Put.